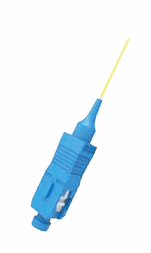 Fibre optic Pigtail - Aksh offers the full range of Optical fibre pigtail in high quality. - Smart design; Various kind of mini boot available. - The SC housing color can be Blue, green, beige, Aqua and purple - 0.9mm cable can be tight buffer, loose tube, PVC, LSZH, Hytrel or 12DIN color.